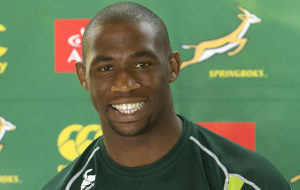 Siya Kolisi who was born Siyamthanda Kolisi is a South African rugby union rugby player. He plays for Western Province in the Currie Cup and the Stormers in Super Rugby. Siya was born on the 16th of June 1991 in Zwide, Port Elizabeth, South Africa. He is also the first black man to lead the Springboks as captain in an international rugby match. Kolisi was a member of the South African under 20-side that competed in both the 2010 and 2011 IRB Junior World Championships. He made his official Springbok debut on the 15th of June 2013 against Scotland at the Mbombela Stadium in Nelspruit. He was born on the 16th of June 1991 in Zwide, Port Elizabeth, South Africa. As of 2018, he is 27 years old. Kolisi is married to Rachel Smith. Their marriage was in a glamorous wedding in the Western Cape in August, 2016. Together, they have a son, Nicholas Siyamthanda Kolisi. Full information on his salary is not known and will be updated very soon.